Wow. Just, wow. I’m writing this at 6 AM, after one emotionally exhausting reading session, for sure making it into a lot of top 10 of the year. I think this novel set a new record for how many times I cried during one reading session. I’m still emotionally ruffled, so if I don’t make as much sense as I think I do, I humbly ask for your forgiveness. 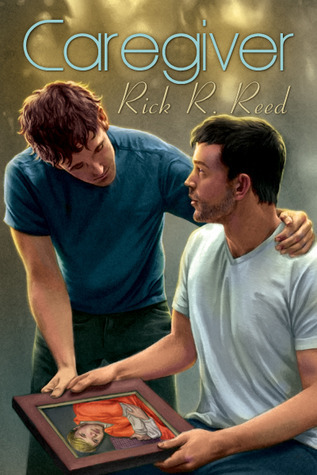 In all honestly, I wanted to read and review this as soon as I read the blurb on NetGalley, I knew it wouldn’t be easy to read it because the topic of AIDS doesn’t exactly make for light reading, but aside my usual search for diversity, I had a feeling this novel would be a very good read. It turned out to be not good, but absolutely fantastic, and I’m not thinking of the m/m romance area only when I say this, I’m thinking about all books. And though I knew it would be dramatic and I sort of prepared myself for it or at least I thought I had, it turned out I couldn’t have been prepared enough; hell, I just read it and I’m not sure I’ll be prepared for it when I’ll reread it (and it’s very probably going to happen soon). The story is absolutely heart-wrenching and at the same time happy, but la piece de resistance here, in my opinion, are the characters. Adam and his smart mouth, Sullivan and his caring, Dan and his generosity, Mark and his courage; each one of them are characters that I admire, each one of them for basically different reasons. In the mids of sorrow, torment and death, blooms beautiful love. This novel is a study of love and its resilience in the most dire of circumstances, and it’s not always going to be easy – or rather it will most often be hard, but even when it’s excruciatingly hard to see the light at the end of the tunnel, love will gingerly take you by the hand and show you the way. Regardless of raging storms the sky returns to shining, despite horrible circumstances and pain, love enriches your heart. I could talk about each of the four guys and rant and rave and fangirl, yes, even about Mark, but I’m not going to spell anything out for you guys. You go and read this, it’s a mature plot by depth of view and topics it brings forth, but not graphic, it’s a beautiful romance entwined with pain and trials, but isn’t that how life is as well? I found the writing to be really beautiful, delicate but effective in building the atmosphere around you and showing off different sides to situations and characters. I cannot begin to tell you how beautiful this novel is, it’s stupendous, you just have to read it or you’ll be missing out big time. Don’t shy away from the difficult points it raises, be brave and read it, feel it, live it in your heart, I’m sure you will love it just as much as I did.